Attending one of his father's charity polo matches on June 10, 2018, in Gloucester, George spent the day running around. Prince George was almost as big a star at Princess Charlotte's christening as his baby sister. He takes a stand outside St Mary Magdalene on the Sandringham estate on July 5, 2015. 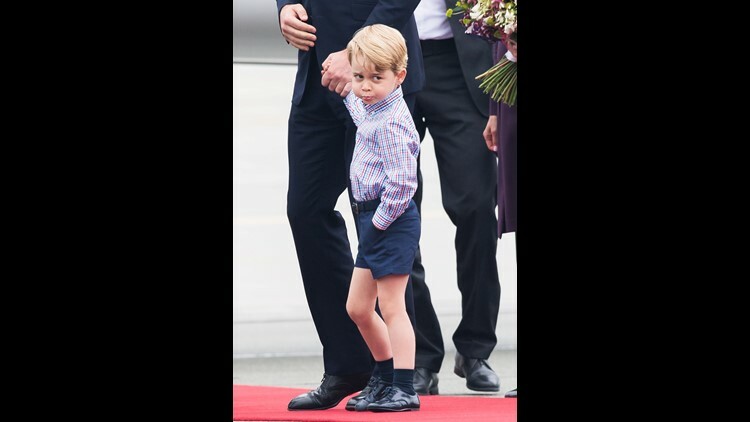 Prince George aims a scowl towards the media at the Warsaw airport during an official visit to Poland on July 17, 2017. 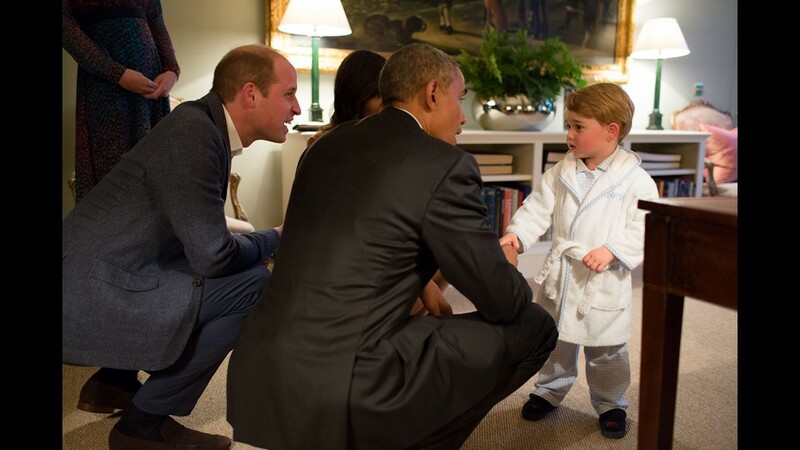 The cuteness level threatened to overload when President Obama got to meet Prince George before he and Mrs. Obama had dinner with the little prince's parents and uncle Harry at Kensington Palace on April 22, 2016. George, who got to stay up 15 minutes past his bedtime, shook hands with POTUS while dressed in a bathrobe and monogrammed slippers. It was his first royal meet-and-greet, and it won't be the last for the little future king. 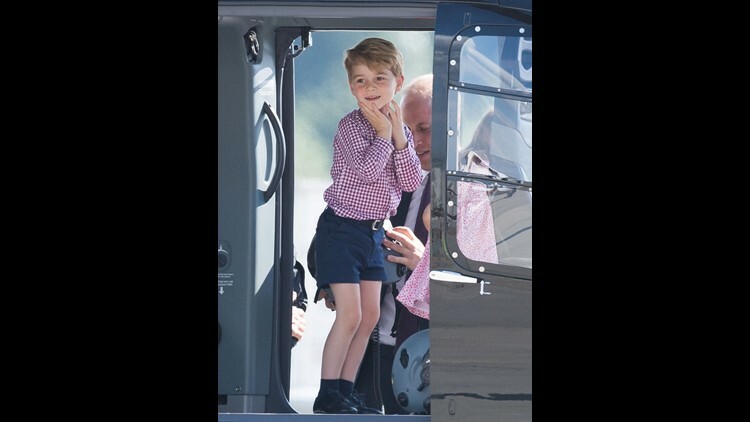 Prince George couldn't contain his excitement checking out a helicopter at the Hamburg airport on an official visit to Germany on July 21, 2017. What, me worry? Prince George looked ready for anything standing with father Prince William at Kensington Palace before leaving for his first day of school on Sept. 7, 2017 in London. 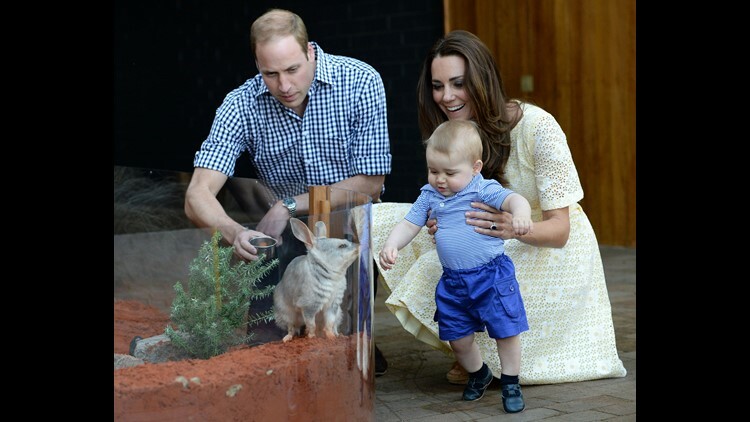 Prince George meets a bilby called George at the Bilby Enclosure, named for the prince, at Sydney's Taronga Zoo on April 20. It was George's second official public engagement of his young life, during his parents' Down Under tour of Australia and New Zealand. Prince George arrives for his first day at Thomas's Battersea school, on Sept. 7, 2017, in London. 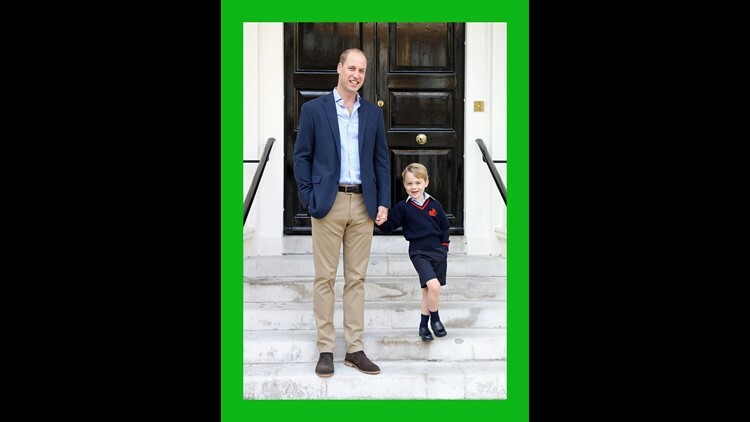 Prince William and Prince George pose at Kensington Palace just before leaving for his first day of school on Sept. 7, 2017. Prince George accompanied by Prince William arrives for his first day at Thomas's Battersea school where he is met by Helen Haslem, head of the lower school on Sept. 7, 2017 in London. Prince George's portrait for his fourth birthday, on July 22, 2017. It was taken at Kensington Palace at the end of June 2017 and released on July 21, 2017, by his parents, Prince William and Duchess Kate of Cambridge. On the last day of the Cambridge royal tour of Poland and Germany, Prince George is delighted to explore a helicopter at the Hamburg airport, on July 21, 2017. Prince George sits in a helicopter as his parents visit the Airbus Factory in Hamburg. Don't forget your helmut. Prince George clambers around a helicopter model before departing Hamburg airport on the last day of royal tour of Poland and Germany on July 21, 2017 in Hamburg, Germany. Prince George with his mother Duchess Kate, and sister Princess Charlotte arrive at Berlin Tegel Airport on Day 3 of the royal tour, July 19, 2017 in Berlin. Prince George seemed a little sleepy when he arrived with his family at the Berlin airport on July 19, 2017. Prince George seemed skeptical upon arrival at the airport in Warsaw on July 17, 2017, Day 1 of the royal tour. He aimed side eye at the media mob covering the Cambridge family's five-day tour of Poland and Germany. Hello, Poland! Prince George and Princess Charlotte peer from their plane window on arriving in Warsaw, Poland, for first day of five-day tour. Ho-hum, you've seen one parade, you've seen them all. Prince George looks a little bored on the balcony of Buckingham Palace with other royals after the annual Trooping the Colour parade to celebrate his great-grandmother Queen Elizabeth II's official birthday, in London, June 17, 2017. Prince George, soon to be 4, and little sister Princess Charlotte, 2, look a lot alike now, and he's grown. The traditional balcony appearance after the Trooping the Colour parade is the first glimpse at the royal heirs since they were in their Aunt Pippa Middleton's wedding on May 20, 2017. Duchess Kate leans in to keep an eye on her two children, Princess Charlotte and Prince George, as they watch the conclusion of the Trooping the Colour parade in London on June 17, 2017. A family portrait on the palace balcony, with Prince William, Duchess Kate, Princess Charlotte and Prince George, on June 17, 2017 in London after the Trooping the Colour parade. Prince George of Cambridge waves from the car after the wedding of his aunt Pippa Middleton and James Matthews at St Mark's Church, where he served as a pageboy, on May 20, 2017 in Englefield, England. Pippa Middleton kisses new husband James Matthews as they pose following their wedding on May 20, 2017, with their retinue of bridesmaids and pageboys, including Princess Charlotte (L) and Prince George (2R). Prince George and other pageboys at his aunt Pippa Middleton's May 20, 2017, wedding wore olive-gold knee pants, a double-breasted white silk shirt and white knee socks by Spanish brand Pepa & Co. Prince George pauses outside St. Mark's Church with his sister Princess Charlotte and his mother, Duchess Kate of Cambridge, after the wedding of his aunt, Pippa Middleton, on May 20, 2017. Prince George leads the pack of pageboys and bridesmaids after his aunt Pippa Middleton's wedding on May 20, 2017, in St Mark's Church in Englefield, England. Prince George and Princess Charlotte accompanied their parents to Christmas Day services at St. Mary's Church in Englefield, near the Middleton family estate in Bucklebury, England. George looked very traditional in a long grey-blue coat with blue knee socks. Prince George happily snacked on a candy cane after the Christmas service. It's the annual Queen's Christmas Lunch at Buckingham Palace and all the royals turned up on Dec. 20. Among the first to arrive, Prince William, Prince Harry and Duchess Kate, with little Prince George in the backseat. 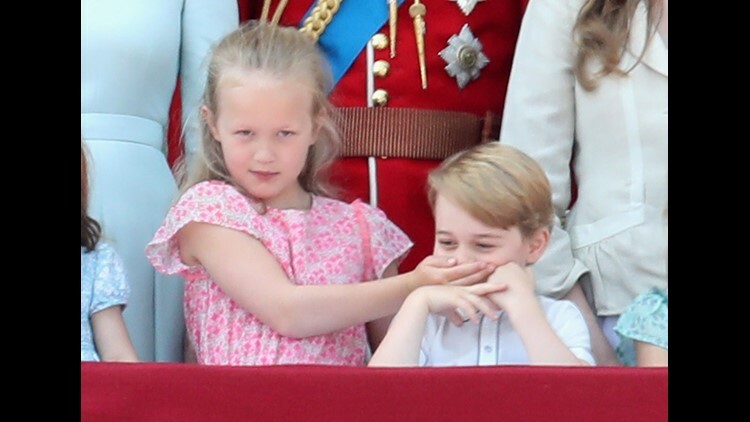 Prince George's puckish personality started to emerge in 2016, especially when he and sister Princess Charlotte accompanied their parents on an official visit to western Canada in late September. He was camera-ready as the family prepared to leave Victoria Harbour to board a sea-plane on the final day of their tour. Only 3 and George is already a fan of flying machines. As he left Victoria Harbour, he pressed his face against the window of a sea-plane, head phones on his head, on his way home Oct. 2, after a tour of western Canada with his parents and sister. Earlier on the Canada visit, George and Charlotte attended a children's party in Victoria, where they delighted playing with bubbles. The father-son bond is close. George hugs Prince William at the children's party in Victoria on Sept. 29. Prince George turned 3 on July 22, 2016, and his proud parents, Prince William and Duchess Kate, released more pictures of him to delight his fans. The snaps were taken in mid-July at the family Norfolk estate. Just a boy and his dog. George and family dog Lupo relax on a picnic blanket as the little prince offers Lupo some ice cream. The picture, taken at the family's Norfolk estate in mid-July, was one of four to mark George's 3rd birthday. Prince George celebrated his 3rd birthday on July 22 with a brand-new photoshoot, showing the future king looking all grown up. Prince George balances barefoot on a wooden swing adorned with his parents' names, William and Catherine. 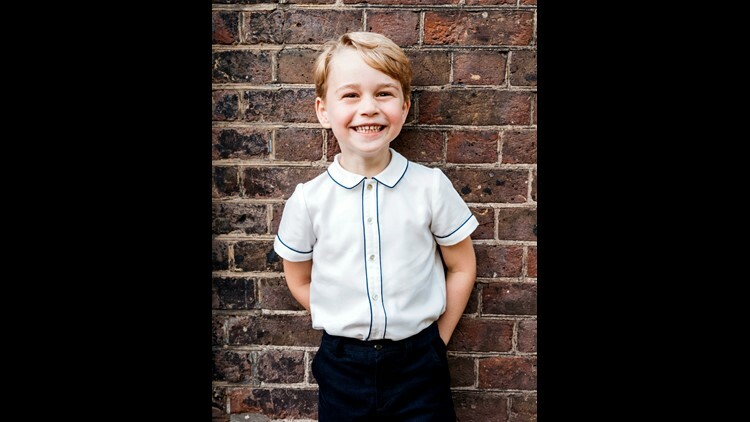 The picture, to mark his 3rd birthday, was taken at his family's Norfolk estate in mid-July. The Sunuva T-shirt he's wearing (about $12) sold out after the picture was released. Prince George turns 3 on July 22 so maybe it was an early birthday present when his parents took him to a huge military air show in Gloucestershire on July 8 - his first official engagement in the U.K. George displayed his usual adorableness, along with a few tears as his Terrible Twos wind down. George was initially a little freaked out by all the noise of the aircraft but Mummy's steadying hands and a pair of earphones quickly dried his tears. He rubbed his eyes after sitting in a ''Squirrel'' helicopter similar to the one that his father trained on during the Cambridge visit to the Royal International Air Tattoo at RAF Fairford on July 8, 2016 in Fairford, England. This is so cool, Daddy! George got to sit in several aircraft during the Cambridge visit to the Royal International Air Tattoo at RAF Fairford on July 8, 2016 in Fairford, England. Prince George is still just 2, about to turn 3, so he's still a big fan of hanging out in his parents' arms. George gives one of his signature royal waves from the cockpit of a plane he checked out during his visit to a huge military airshow at an air force base in Fairford, England on July 8. Dressed in blue shorts, white polo shirt and canvas shoes, George points up at the tail rotor of a "Squirrel" helicopter similar to the one that his father, Prince William, trained on, during the family's visit to the military air show at Fairford, England on July 8. George also got to sit in one of the British RAF Red Arrows Aerobatic Team planes. Princess Charlotte made her first appearince on the Buckingham Palace balcony for the special Trooping the Colour of 2016, honoring her great-grandmother's 90th birthday, on June 11, 2016. It was Prince George's second appearance, but Charlotte, at just over 1 year old, already has the royal wave down right. All together now: Awwwww! Another historic photo of Queen Elizabeth II and her three royal heirs, Prince Charles, Prince William and Prince George, standing on foam bricks so his head is a roughly the same level as his relatives for a picture, taken in summer of 2015, that will be on new stamps issued in honor of the queen's 90th birthday on April 21, 2016. George got to thank the Obamas in person for the rocking horse they sent him when he was born in July 2013. Prince George poses on his first day of nursery school near his parents' country retreat, Anmer Hall, on the royal Sandringham estate in Norfolk, on Jan. 6, 2016. Prince George examines the mural on the wall of his nursery school on his first day, in photo taken by his mum, Duchess Kate of Cambridge, on Jan. 6, 2016. The cutest, most royal family in the land. Prince William holds George after the christening. It was a double-dose of Prince George the weekend of June 13-14, and a thrill for U.K. royal fans. On Saturday, he made his first appearance on the Buckingham Palace balcony for the Trooping the Color ceremony. On Sunday, played on the lawn with mum Duchess Kate and others in his family at a charity polo match at Beaufort Polo Club in Tetbury, England. Duchess Kate looked fit and slim, just six weeks after the birth of Princess Charlotte, when she and Prince George played on the sidelines at a charity polo match on June 14. Prince George of Cambridge is held by Prince William, Duke of Cambridge as Catherine, Duchess of Cambridge and Queen Elizabeth II look out from the balcony of Buckingham Palace during the Trooping The Color on June 13, 2015 in London. Camilla, Duchess of Cornwall, Prince Charles, Prince of Wales, Prince George of Cambridge,Prince William, Duke of Cambridge, Catherine, Duchess of Cambridge and Queen Elizabeth II look out from the balcony of Buckingham Palace during the Trooping the Color on June 13, 2015 in London. Master Painter Tom Mason holds a figurine designed by artist Neil Faulkner of Princess Charlotte of Cambridge held by her mother Catherine, Duchess of Cambridge, standing alongside Prince George, at Waterford Wedgewood Royal Doulton factory on June 10, 2015, in Stoke-on-Trent, England. The hand painted bone china figure, which is produced by Royal Doulton, will be launched as a limited edition of 3000 pieces and will be available from September 2015. Undated handout photo released by the Duke and Duchess of Cambridge of Prince George and Princess Charlotte. The photograph was taken by the Duchess in mid-May at Anmer Hall in Norfolk. Prince George visits mom and sister in St. Mary's Hospital in London on May 2, 2015. Prince William holds son Prince George as they wave to media outside St. Mary's Hospital on May 2. Prince William picks up Prince George as they arrive at St. Mary's Hospital. Prince William kisses George, tells him he's a "good boy" as they go inside the hospital. One of the three official Christmas images taken in late November showing Prince George in a courtyard at Kensington Palace in London. Happy birthday to Prince George, turning 1 on July 22. Not until recently has the world seen much of him in action but now that it has, he's become the most popular, and certainly the most famous, baby on the planet. 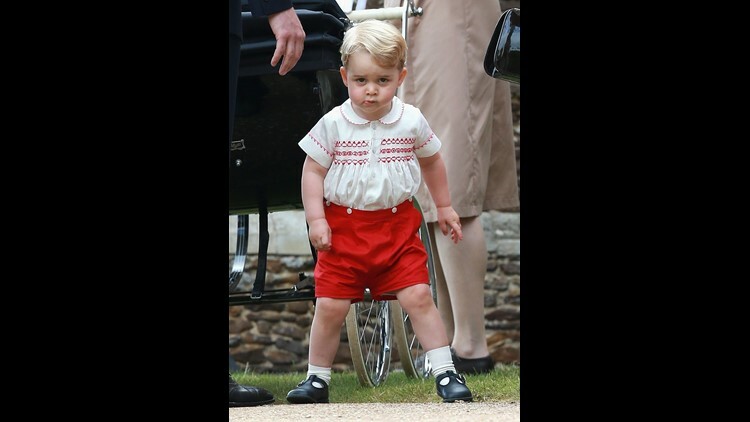 Take a look back at how Prince George has grown. Will and Kate and baby George were greeted by cheering, from the media and the public, as they emerged from St. Mary's Hospital the day after the birth of their royal baby. Welcome to the world, Prince George of Cambridge. A day after his birth on July 22, 2013, he's presented to the world and a waiting media mob by parents Prince William and Duchess Kate outside St. Mary's Hospital in London where he was born. Prince William strapped his baby son in himself when they drove away from St. Mary's Hospital in London the day after George was born. The first picture of George and family appeared on August 20, 2013. The Cambridges posed in the Middleton family estate's back garden with George, thier dog Lupo and the Middletons' dog Tilly, for a photo taken by Kate's father, Michael Middleton, at his home outside London. There were few sightings of George after the christening, until a photographer caught him on Feb. 10, 2014, as he and his mum were on their way to a Middleton family vacation in Mustique. The picture of the roly-poly prince in the cute striped hat made the cover of 'Hello' magazine. It was George's first paparazzi shot, and no doubt not his last. The Cambridge Down Under tour of New Zealand and Australia in April, their first official overseas tour with their son, provided new opportunities for the world to see George, nearly 9 months old. They arrived in Wellington on April 7, and Kate carried George down the steps as the wind and rain blew up her scarlet military-style coat. The close-up pictures of George inspired cooing around the world. He was awake, engaged and wiggling the whole time, and looked a lot like his father did at the same age. 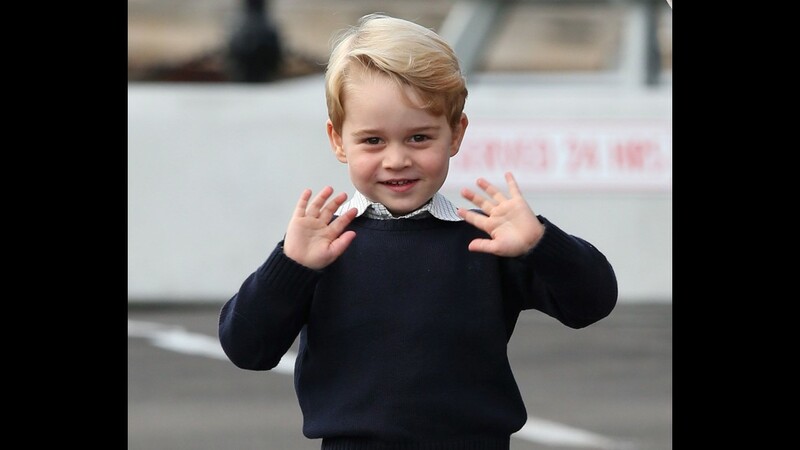 This is reportedly Will and Kate's favorite picture of George from the Down Under tour, when he made his first offical public appearance of his life at Government House in Wellington, during a play-date with a bunch of Kiwi babies of the same age on April 9. It was the most covered play-date ever. George got down on the floor to play with intriguing toys and other babies during his Plunket Play Group appearance in Wellington. He smiled, he gurgled, he crawled, he interacted with some of the other babies, and the photographers loved every minute. The first of the many stuffed toys George would receive Down Under, this large soft bear was presented to him by the organization that arranged his Plunket play-date in Wellington. When next seen, this time in his father's arms at the Wellington Airport, George and his parents were off to Australia, on April 16. After a few-hours flight from New Zealand, long enough for all three to change clothes, they arrive in Sydney on April 16. After arriving at Admiralty House, the official Sydney residence of the Governor-General, Sir Peter Cosgrove presents George with one of the many gifts he received Down Under, in this case a giant stuffed wombat. He seemed to be pleased, but Prince William was especially excited. The zoo visit was a huge success from a picture standpoint. George looked ready for anything when he arrived in his mother's arms at the Bilby Enclosure. George was engaged, active and vocal during the zoo trip, the most we had seen him up to that point. Photographers were able to snap scores of pictures showing the family interacting in a way that showed a happy baby with adoring parents. George got a stuffed bilby at the zoo, but he eventually dropped it as he gnawed on a yellow bumper sticker. Another airport arrival, another quick glimpse of George, here in Canberra on April 20. Despite some worries beforehand, according to Prince William, George turned out to be a trouper when it came to long-distance flights, and every time he came off or got on an airplane he was engaged and wriggling vigorously. After three weeks, the Down Under tour was over and the family prepared to depart from Canberra, Australia. Once again there was a brief glimpse of George as the his parents boarded their aircraft. When next seen, George was 9 months old and almost walking on his own. 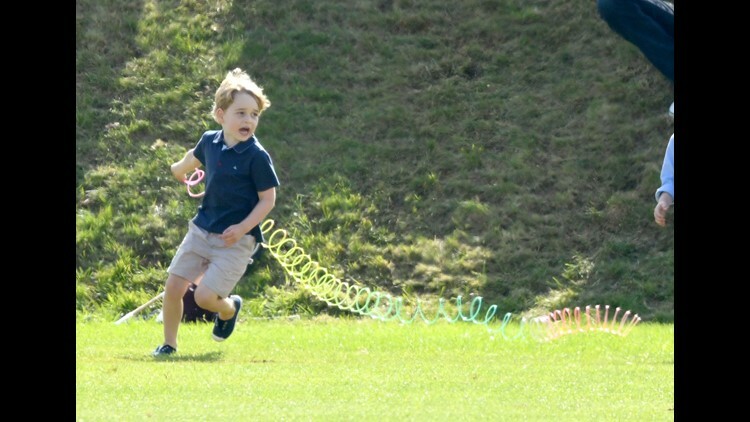 Kate took him to a polo match where Prince William was playing in Gloucestershire, on June 15, and photographers were able to snap him crawling and walking with the help of his mum. Turns out 'Vanity Fair' thought that picture of the family at the Sydney zoo would make a perfect cover shot for their August issue celebrating George's first birthday. Prince George on July 2 at London's Natural History Museum in official photo issued to mark his first birthday July 22. A second birthday photo shows George with his parents, Prince William and Duchess Kate, as they explore the 'Sensational Butterflies' exhibit at London's Natural History Museum in early July. George gets close enough to touch a what's believed to be a Brazilian Blue Morpho butterfly on his father's hand during his birthday visit to 'Sensational Butterflies' at London's Natural History Museum in early July.